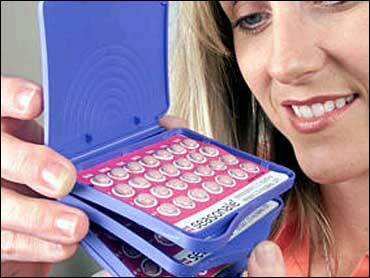 Birth control pills helped spawn a social and sexual revolution when they first became widely available in the 1960s. And the latest version of the pill, approved by the Food and Drug Administration Friday, could start a whole new revolution. For millions of women, the new pill will mean freedom from that monthly menace: the menstrual cycle, reports CBS News Correspondent Elizabeth Kaledin. Unlike traditional birth control pills which create an artificial period every 28 days, women taking the new Seasonale stay on the drug for 84 days at a stretch. The pills aren't a new chemical. They contain the same combination of low-dose estrogen and progestin found in many oral contraceptives. Nor is the idea of menstrual suppression new. For decades, many doctors have told women how they can skip a period by continually taking the active birth-control pills in each month's supply and ignoring the week of dummy pills in each packet. But Seasonale promises to make the option a little more convenient, with packaging that gives women 12 straight weeks of active pills and then a week of dummy pills for their period. And the FDA's approval means menstrual suppression could become more common, as Seasonale's advertising alerts women to the option. "Any patient for whom the birth control pill is a reasonable option is a candidate for the new extended use cycle," says Dr. Shari Brasner. To develop the drug, manufacturers polled women and literally asked them how many periods a year would be acceptable. The answer: not very many. In fact, two-thirds of women said four would be plenty. "It turns out this normal, natural process known as menstruation seems not to fit into to the modern woman's life," says Brasner. "I think this is a new and very exciting way for women who are traveling, women who are really juggling quite a bit to take back a little control." Angela Fontaine, 29, participated in trials of the drug. A full-time nurse, mom and outdoorswoman, her periods not only gave her cramps, they cramped her style. "It's just an inconvenience," she says. "It's just nice to not have to worry about it." She plans to take the drug for good, while others like Barbara Alexander find the whole idea unnerving. "It seems a little unnatural," Alexander says. And neither is Seasonale without its drawbacks, the FDA cautioned. While women have fewer scheduled periods, studies show Seasonale users have about twice the risk of unexpected "breakthrough" bleeding between periods as woman taking conventional monthly cycle pills, especially in the first few cycles of use. Also, 7.7 percent of Seasonale users dropped out of studies of the drug citing unacceptable bleeding, compared with 1.8 percent of women taking conventional monthly pills. Some Seasonale users had so much breakthrough bleeding that their total days of bleeding over a year were no less with the new drug than with regular pills, FDA said. So the agency ordered that Seasonale's label state that women must weigh that inconvenience against fewer regular periods. "Each woman will respond to this product somewhat differently," said FDA's Dr. Scott Monroe. "Some will find they respond entirely as the product was designed to function, and others will have increased intermenstrual bleeding to the extent that they choose not to continue with the product." Maker Barr Laboratories plans to have prescription-only Seasonale in pharmacies by November. Barr wouldn't reveal Seasonale's price but said it will be comparable to other brand-name oral contraceptives, which sell for roughly $1 a pill. Generic versions can cost half that amount. Having fewer periods "was absolutely fabulous," said Shannon Zaichenko, 27, of Chesapeake, Va., who spent three years in a study of Seasonale. "It's the convenience, not being bogged down, not having to plan vacations or just lifestyle around seven days of bleeding," she said. A frequent traveler, Zaichenko recalled that before Seasonale her periods "always seemed to happen when I was on a plane for 20 hours." Seasonale also may be attractive to women who experience severe cramping, heavy bleeding and other menstrual-related symptoms, a number Barr estimates at 2.5 million in the United States. But the National Women's Health Network says some Seasonale proponents falsely imply that limiting menstruation is generally healthier, a message the consumer group calls particularly unwise for young girls. "We already have a lot of shame and stigma in this society about menstruation," cautions the network's Cynthia Pearson, who has asked Barr to ensure that Seasonale ads don't convey that impression. During the menstrual cycle, fluctuations in estrogen signal the uterine lining, or endometrium, to thicken in preparation for nourishing an embryo. If pregnancy doesn't occur, that excess lining is sloughed off, accompanied by bleeding. The big safety question is whether four periods a year are enough to allow the uterus to shed any tissue that builds up. A study by Eastern Virginia Medical School, which developed the three-month pill regimen, shows they are. It tracked 682 women taking either Seasonale or regular monthly pills for a year. Seasonale proved equally effective at preventing pregnancy. Side effects, too, were similar with the exception of breakthrough bleeding, which did decrease with each cycle of Seasonale use. "There is no concern in delaying the period for three months," says Dr. Vanessa Cullins of Planned Parenthood. In fact, she notes, women today have far more periods in their lifetime than their ancestors before the era of contraception, when women spent much more time either pregnant or breast-feeding, both of which block menstruation. Not every woman will be comfortable with Seasonale, Cullins said monthly bleeding gives some contraceptive users added reassurance that they're not pregnant.